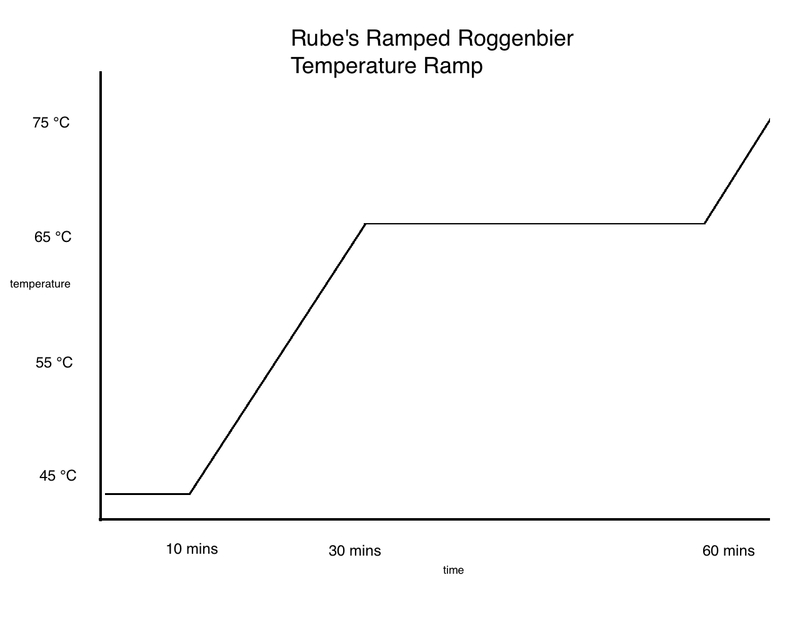 A diagram of the temperature ramp the steeped grains (really a small mash) undergo. This should make for a more clove-y beer. 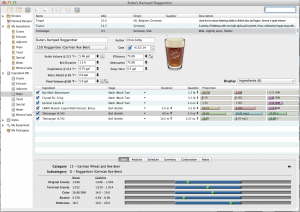 Here’s another surefire extract recipe — a roggenbier. 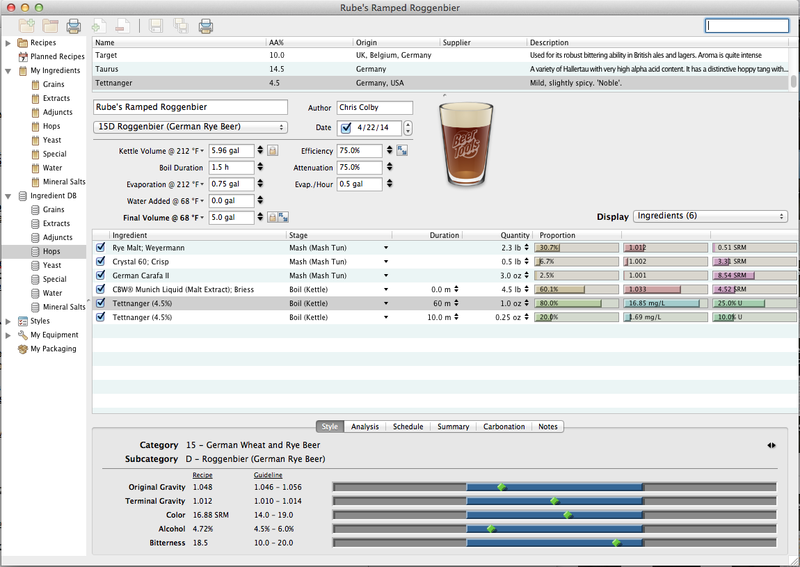 Roggenbiers are like dunkelweizens, but made with rye instead of wheat. The distinctive “pumpernickel” flavor of rye blended with the banana and clove aroma of a hefeweizen make this a flavorful and interesting beer. The “spicy” notes of Tettnang hops round out the aroma. You’ll either need to make a small (1-qt./1-L) yeast starter, or add some neutral dried ale yeast to boost your pitching rate, to best brew this beer. 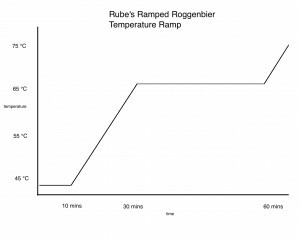 Hopefully these two little twists don’t make brewing this beer Rube Goldbergian, because this beer is flavorful and fun to brew. A copper/amber ale with the “snap” of rye and banana/clove aroma of a hefeweizen. In your brewpot, begin heating 2.0 gallons of water to a boil. Aim to reach boiling when the small mash is done. In a separate, large (8 qts. or larger) pot, heat 1.0 gallon of water to 120 °F. Place crushed grains in a steeping bag and submerge in second pot. The temperature should settle in around 109 °F. Let the steeping grains (really a small mash) rest for 10 minutes. Then, heat the mash to slowly ramp up 150 °F. Stir constantly. The whole temperature ramp from 109 °F to 150 °F should take about 20 minutes. Let the mash rest at 150 °F for 30 minutes, then heat mash to 168 °F. In a third pot, heat 0.50 gallons of water to 170 °F to use as sparge water. After the grains have mashed, place a colander over your brewpot, set the grain bag in it and pour the wort through it (to filter out solid pieces of grain); then, rinse it with the sparge water. Stir in the rye malt extract and bring to a boil. You should have about 3.0 gallons of wort. Do not let wort volume drop below 2.5 gallons during boil. (Top up with boiling water, if needed.) Once boil starts and the first bits of hot break show, add your hops and boil for 60 minutes. Add second dose of hops with 10 minutes left in boil. Stir in Munich malt extract in last 10 minutes. (Dissolve it in a small amount of wort first to make it easier to stir in.) Chill wort to 65 °F and transfer to fermenter. Add water to make 5.0 gallons and aerate thoroughly. Pitch yeast and let ferment at 68 °F. Keg or bottle and carbonate to 3.0 volumes of CO2. Bottle in heavy (hefeweizen-style) bottles. In your brewpot, begin heating 7.5 L of water to a boil. Aim to reach boiling when the small mash is done. In a separate, large (8 L or larger) pot, heat 3.8 L of water to 49 °C. Place crushed grains in a steeping bag and submerge in second pot. The temperature should settle in around 43 °C. Let the steeping grains (really a small mash) rest for 10 minutes. Then, heat the mash to slowly ramp up 66 °C. Stir constantly. The whole temperature ramp from 43 °C to 66 °C should take about 20 minutes. Let the mash rest at 66 °C for 30 minutes, then heat mash to 76 °C. In a third pot, heat 2.0 L of water to 77 °C to use as sparge water. After the grains have mashed, place a colander over your brewpot, set the grain bag in it and pour the wort through it (to filter out solid pieces of grain); then, rinse it with the sparge water. Stir in the rye malt extract and bring to a boil. You should have about 11 L of wort. Do not let wort volume drop below 9.5 L during boil. (Top up with boiling water, if needed.) Once boil starts and the first bits of hot break show, add your hops and boil for 60 minutes. Add second dose of hops with 10 minutes left in boil. Stir in Munich malt extract in last 10 minutes. (Dissolve it in a small amount of wort first to make it easier to stir in.) Chill wort to 18 °C and transfer to fermenter. Add water to make 5.0 gallons and aerate thoroughly. Pitch yeast and let ferment at 20 °C. Keg or bottle and carbonate to 3.0 volumes of CO2. Bottle in heavy (hefeweizen-style) bottles.